Apart from being great in taste, caffeine packs in seriously cool benefits too! If you’re hooked to a freshly brewed cup of coffee every morning in the comfort of your home, you ought to know about cold brew coffee. We’re talking about coffee being brewed in cold water/room temperature water (20 degree celsius) for over 16-18 hours and then filtered. What you’d typically achieve is a full-bodied, less acidic and more caffeinated cup of coffee. Given coffee here is not brewed in hot water, the coffee grounds are not subjected to a shock (in mere terms) and rather they’re left for a longer duration to extract the best flavours over time. This delay of extraction results in a rather flavourful and typically less bitter profile in the cup. This happens because hot water extracts all the characters of the coffee bean while cold water, over a longer period, removes the bitter oils contained in the coarsely ground coffee beans. There are people who avoid hot coffee due to digestion issues or other stomach problems. Brewing coffee in cold water mostly works for them as it bears a much lesser percentage of acidity in comparison to hot coffee. A lot of customers I come across talk of acid reflux upon having coffee. I hesitatingly - but with some sub-conscious confidence - offer them to try a sip of cold brew coffee. Though it’s extremely important to have water before having a cup of coffee as it is said to have dehydrating properties. However, there’s more water to coffee ratio in a cold brewed cup, than in any other method of brewing coffee. This doesn’t mean we don’t need water, it means we could do with a little less water sometimes. Do you add sugar or milk to your coffee? It’s absolutely fine. As long as you enjoy your drink, it’s important to keep it that way. More importantly, hot coffees are manier the times, more bitter than a glass of cold brewed coffee. Let’s understand how temperatures affect coffee. Most methods of extraction using hot water, require you to grind your coffee fine or a medium size. Here, hot water would extract maximum characters of the coffee bean, even the bitter oils. Using cold water and a coarse grind would allow us to let it steep for a longer duration and let the best flavours shine out. Hence, if you’ve added milk and sugar to your cup, give cold brew coffee a try in its absolute vanilla form - chilled, without milk or sugar. The natural sweetness, flavours of coffee would appeal to you so much that you wouldn’t need that extra cream to balance out the bitterness. You may, however, choose to cut the strength using lots of ice. If you like to experiment, go ahead and try out some mocktails and cocktails with it! Tonic water, for instance, would lend its own sweetness. If you’re feeling lethargic in the summer heat, it would typically mean your blood vessels have dilated and there’s less water in them. They expand to radiate as much heat as possible from your system. You start sweating more, losing essential salts and feeling thirsty. Basically, the body is wanting more water to fill in those radiated vessels. The blood flow is now focused on functioning of the organs rather than flowing to the brain and heart. Hence the dizziness and high heartbeat rate when you’re tired. A neurotransmitter in the brain called Adenosine is released that causes all of this misrouted activity. That’s where caffeine comes in. Caffeine attaches itself to the Adenosine receptors. In turn, it works on contracting blood vessels and allows a better blood flow to the heart and brain. In no time, you’re up and awake, ready to take on the world. This, however, needs to be balanced with a glass of water because water is what will bring back the required salts to your body. All in all, a combination of water and caffeine would work well on a hot summer day. If you’re wondering why cold brew over hot coffee, well, the caffeine content in a glass of cold brew coffee is way higher than most other ways of brewing coffee using hot water. Primarily because of the long interaction between water and coffee. Also, as mentioned before, the amount of water used per gram of coffee, in a cold brew method is usually more than in a cup of hot brewed coffee. Cold brew coffee seems to be the new energy drink and is seemingly getting popular amongst those using it as a pre-workout drink. 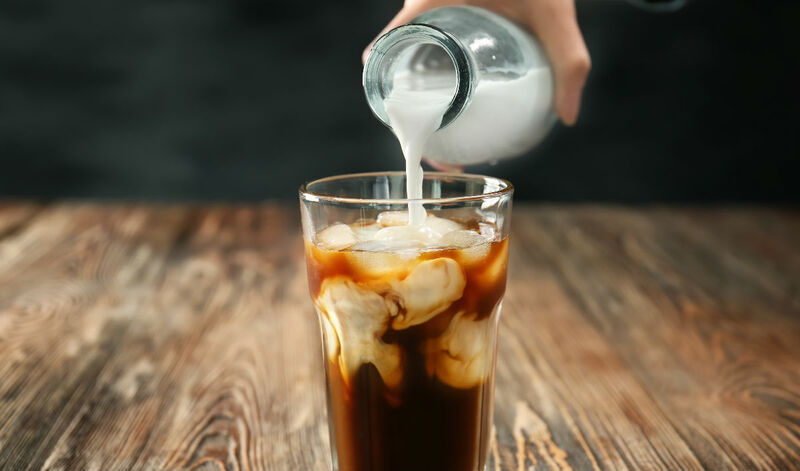 Here’s how you can make the perfect cold brewed coffee!